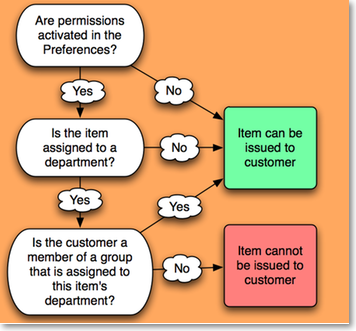 Item departments are a mechanism by which you can restrict item availability to certain customers only. Each customer can be a member of only one group. Each group can have access to items from multiple departments. The Activate restricted item access by customer group option must be turned on in Preferences>Invoices2 before this option to work. Here is a summary of how department groups affect whether or not an item can be issued. When you attempt to issue stock to a customer whose group does not have access to the department of the item you are issuing, either a warning will be displayed or mSupply® will not allow you to issue the stock - depending on how your preferences are set. Items that are members of a department can not be issued to any Customers that are not members of a group. Each department can have any number and combination of items and departments in it. The right hand list shows the customer groups that presently have access to the department which is highlighted on the left hand side. The icons on the right side allow you to add and/or remove groups that have access to the highlighted department. Double-click (or click and then click OK) to add a group to the current department. You will be given a warning if you try to add the same group twice. Customer groups can be used to group customers (or suppliers) together for reporting purposes, and also to set up an item restrictions scheme, allowing some items to be issued only to certain customers. An explanation of how to set up a restriction scheme is in Managing Item access. Click the New group button to add a new group. You can enter or edit the group name in the top field. The list displays all names which are members of this group. The drop down list displays the group to which this customer belongs, and to remove the customer, make sure none is selected from the drop down list; to assign the customer to a different group, highlight the new group in the drop down list. Click OK to leave the window. Overview: A manufacturer might create departments for raw materials, packing materials, and quality control reagents. A drug store or hospital might create departments according to dose form or according to pharmacological classification, etc. By default the list displays in alphabetic order; clicking on Departments toggles between alphabetic order and reverse alphabetic order; you may also drag and drop individual departments to any position in the list to suit your own requirements, and on clicking OK you will be asked whether or not you wish to save the list in the order you have specified. To add a new department, click the New dept button. The radio buttons allow you to choose what will happen when you attempt to issue an item to a customer who is not a member of a linked group. Either the user can be warned or the issue can be disallowed. This only applies if you have Activate restricted item access by customer group turned on in the Preferences - otherwise you can ignore this setting. Double-click it to display the entry window, then click the Delete button. Note that you can not delete a department that has item members. You will be warned if you try to do this. To delete a department with Items, click the items tab and note the items that are members, then edit those items (using the Items > Show items … menu command) and set their departments to either none or a different department. You will then be able to delete the department.